The Perky-Pet Garden Sip & Seed Bird Feeder is made of resilient plastic with an antiqued looking copper finish. This patent pending design featuring double silos is a nice addition to any and all back yards. This product is exclusive to Perky-Pet. The Garden Sip & Seed is equipped with interchangeable base silos, which can hold either seed or water. This unique feeder can be set up as two silos of seed, a silo of seed and a silo of water or two silos of water. The Garden Sip & Seed holds 1.5 lb of seed and 27 oz. of water. It is visually attractive and sturdily constructed. The unique design allows each container to hold either seed or water (by flipping them upside-down). You can even serve two kinds of seeds to attract various bird species. The containers hang from a curlicue fixture, giving the entire feeder a swinging motion, almost like a pair of balancing scales. This will serve to repel squirrels or other vermin from stealing your birdseed. The only problem we noticed, and it is actually a minor problem, is that the water segment seems unnecessary, because we haven’t seen a single bird or squirrel drink from it. Perhaps it would be different if the weather was hot and we didn’t see any rain for days, but for now we are filling both containers with seeds. The dual containers are designed to hold either water or seed, giving you the option to change the feeder configuration as birds' needs change. It can be used as a single reservoir if desired or split into two individual feeders for use in different locations. Its attractive design and neutral colors can enhance the look of all gardens and backyards. The reservoirs are sealed at the top and after filling need to be flipped in order to hang. This leads to spilling the seeds, but this can be minimized with practice. If water is served in winter it will freeze. That can be a perfect opportunity to switch both containers to seeds. Severe wind or an agitated squirrel may cause the feeder to fall of its hanging hook, but the construction is sturdy enough to minimize possible damage. The feeder features a hanging mechanism which enables it to be hung on a nail, hook or a small tree branch. Both feeder containers have plenty of space for the birds to sit on and eat. This is a well built and beautiful combination of feeder and water for birds. The plastic of the containers seems to be of very high quality. The metal parts are colored a burnished copper. It has handled several thunderstorms and lots of wind quite well. The feeder is made from plastic, which makes it lighter than glass, and it will not be broken if wind or squirrels should knock it down. Although there are no measures to fend off squirrels, the gray squirrel is too large to sit on it and the red squirrels can get to the seeds without needing to chew and destroy the plastic. I was pleasantly surprised to discover that the feeder can be used for both water and seed. Although the seed container is not appropriate for fine seeds like thistle, it works for sunflower seeds or mixes. The containers are easily filled. Filling this feeder can at times be clumsy and requires both hands because the design doesn’t allow the containers to sit on a flat surface. Also, they can’t be refilled while hanging as the bases must be unscrewed for the refilling. This can cause you to spill some seeds/water while flipping the containers, so it is best to fill them one at a time. The sturdy plastic construction is relatively durable, although it is possible that over time the plastic will lose color or warp. The containers are see-through, allowing for easy monitoring of seed and water levels. The trays have secure perches which provide the birds ample room for feeding, drinking or waiting their turn for both. However, the hanging hook seems a bit unstable and may cause strong swinging in windy weather. For this reason, I suggest placing the feeder in a sheltered location, although the swinging motion may serve to stop squirrels from trying to get to the seeds. The smaller hooks on each of the containers are relatively loose, so they are prone to falling if disturbed. The large hook is large enough to give birders many options on where to hang this diverse feeder, because it can fit on a small to medium branch, a shepherd’s hook or any other hook in their garden. 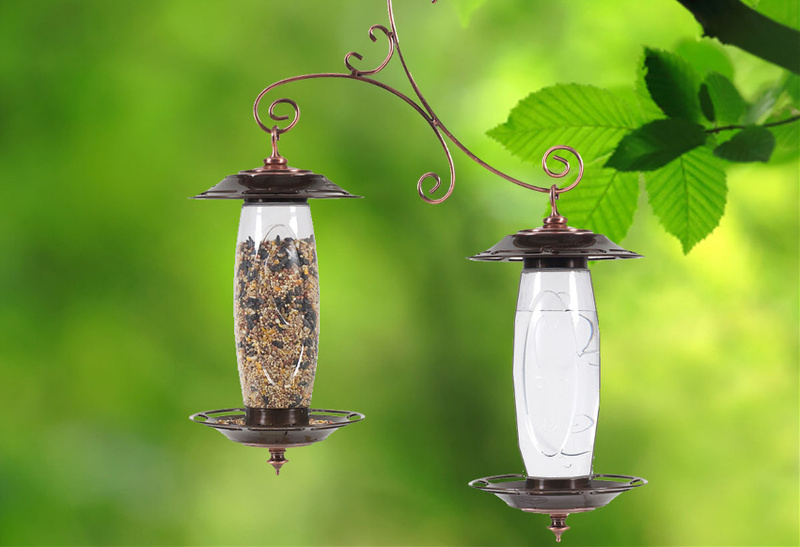 Very beautiful and flexible, the Garden Sip & Seed Bird Feeder is a fine addition to the feeding arsenal of any birder or bird lover. Although it will require you to experiment a bit with finding the proper place for the bird feeder and the best combination of seeds and/or water in the containers, adding this feeder to your garden will be well worth it in the end. Check Perky-Pet 737 Garden Sip & Seed Feeder here.